PONY: These ruffled bowls do not appear in our midst nearly as often as Peacocks; or perhaps you have noticed that? 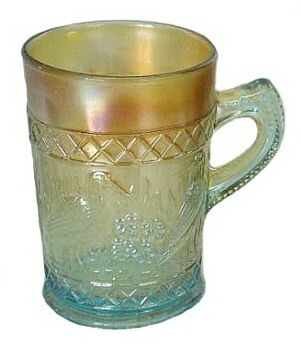 (smile) Diamond Glass Co. introduced their pastel green carnival in 1921, which clearly places this design within their realm. 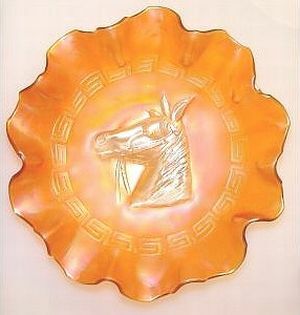 Pony is a simple pattern, but well-done in the 8”-9” size bowls, which may have 6, 8 or rarely 10 ruffles. Rarer still, are some 12 ruffle bowls. The high relief Pony head is clearly defined, leaving an intaglio effect on the underside within the collar base. Amethyst bowls are more difficult to locate than marigold. The highly prized ice green examples usually offer a somewhat stretched, or onion-skin appearance to the iridescence. Pastel lavender and aqua with marigold overlay are other reported colors. 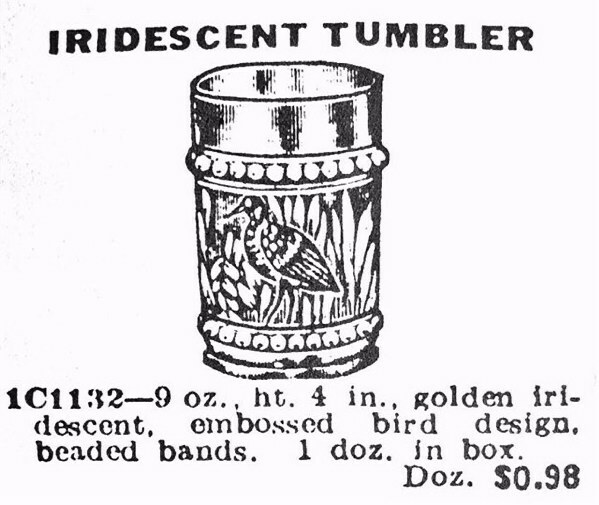 Since some examples in delicate shades of iridized pink are known, this places production by Diamond into the 1928 -1929 timeframe, when Afterglow was included in their line. (We will discuss Afterglow in coming segments). 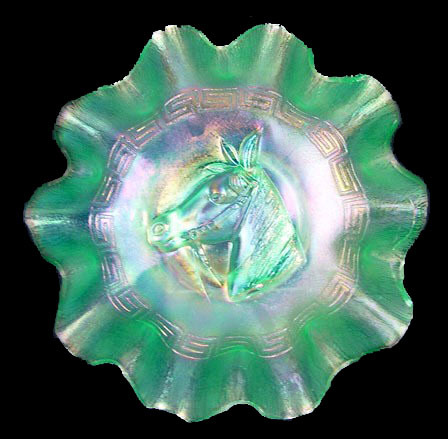 Ice cream shaped Pony bowls in amethyst, marigold and ice green are much more difficult to obtain than the ruffled examples. The plate form has been reported in both marigold and amethyst. Confusing issue: There are both satin and “radium” finishes found within this pattern! Another “issue”: Some examples are known to lack the intaglio effect on the underside. Instead, the area across the collar base is “smooth”. Where large sums of money are concerned: You should exercise extreme caution when considering both the ruffled bowl and the plate in marigold and amethyst. In the early 1980s, L.G. Wright reproduced amethyst examples with a mirror-like, gaudy iridescent result, along with marigold examples which are quite nicely done. You must judge for yourselves. 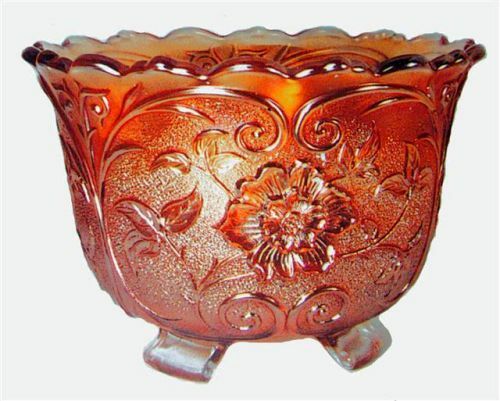 STIPPLED RAMBLER ROSE: The lack of examples known in this footed nut bowl presents a problematic scenario which does not resolve itself over time. Thought to be of Diamond manufacture, there is no real evidence which leads to that conclusion. 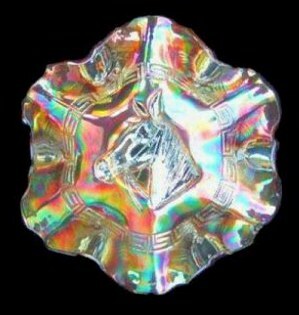 Not found in any Diamond Glass catalogs, nor wholesale products catalogs of the carnival glass period, we only have the resemblance of shape found in the Grape Delight nut bowl to rely on for identification. Shape alone does not constitute reliable attribution. There are said to be a couple of cobalt blue bowls, but marigold is the “usual” color. 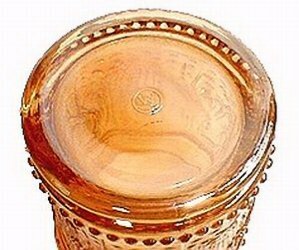 Quite honestly, we have seen neither in our nearly forty years of looking for carnival glass. Perhaps some of our viewers have more updated information about the production source? August 1920 Butler Bros. Catalog. Pattern appeared in Butler Catalogs, 1915-1922. 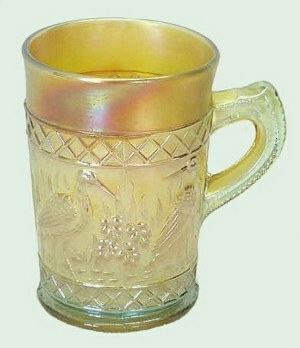 STORK in RUSHES Mugs: are probably the most familiar shape within this design. 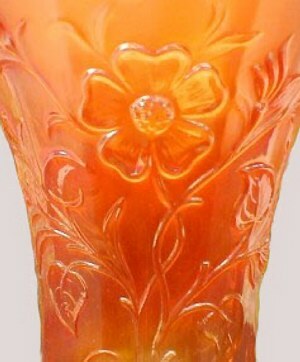 They offer the LATTICE BAND at the top and base and are easily found in marigold. From there the hunt becomes more difficult. They are scarce in amethyst; more so in lavender. Cobalt blue mugs are rare. We are quite pleased to display the two most sought after colors, along with being the most rare; aqua and powder blue, each with marigold overlay. STORK in RUSHES in Blue. 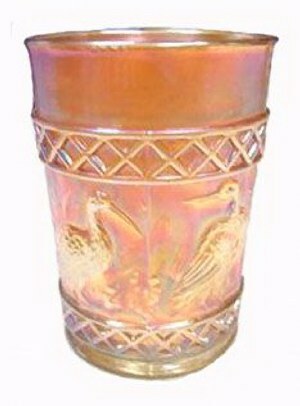 STORK in RUSHES Tumblers: BEADED type is known in marigold, amethyst and cobalt blue. LATTICE BAND type is found in marigold, amethyst and cobalt blue. STORK in RUSHES Beaded Version Repro. by L.G. Wright. NOTE! W within the circle=L.G. Wright Reproduction. 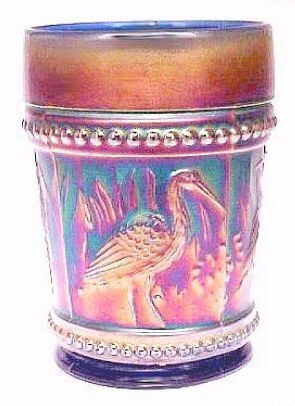 STORK in RUSHES Reproductions: The beaded version of the water set, along with the creamer, spooner, and covered sugar were reproduced in marigold by L.G. Wright. They are well-done, and the trademark is clearly shown on the base (so long as it has NOT been ground off, leaving a slightly “sandy” area.) 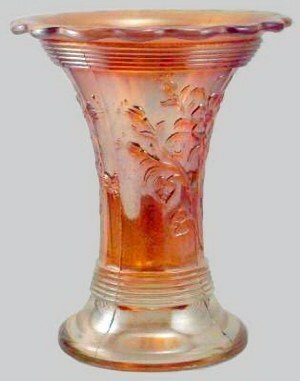 The master berry bowl was also reproduced in purple. SUMMER DAYS Vase (closeup). Note, Flowers growing upright!. 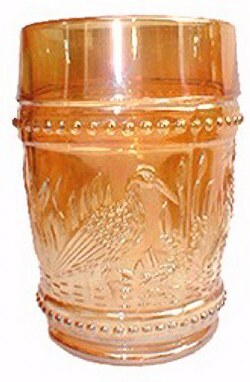 SUMMER DAYS Vase: Written accounts of conflicting uses/manufacturers appear in various carnival glass books. The FIRST account by Angela Hallam directs that she spoke with a glassworker in England who had worked for a time, helping to produce this very vase. Perhaps this is true? In any case, our FULL attention MUST be directed to the stature of this VASE. Our sense that the very design of the flower spray in the upright position dictates its intended use! Matter of fact: there is strong indication that the artist who conceived Stippled Rambler Rose, might have also had a hand in designing this vase. As with many of the production numbers from Diamond Glass Co. during the latter period of business during the `20s, scarcity is a factor. Changes in demand of the times, indicated need for departure from previous structure of “punch sets”, resulting in Stork in Rushes being produced without a base. Creatures of habit, and reluctant to change, some enterprising collector of early days decided that bowl just had to have a base! Books were being written about carnival glass and since ALL previous punch bowls had a base, he reached for the Summer Days, turned it upside down and took the first picture for future generations to emulate. Amethyst and marigold were standard fare for Diamond Glass items, but we are of firm conviction that both the punch bowl and this vase were never intended to mate up! Let's just allow them their rightful individual places in our displays. They're much prettier that way! Therefore, brethren, we are debtors-not to the flesh, to live according to the flesh. The Spirit himself bears witness with our spirit that we are children of God, and if children, then heirs---heirs of God and joint heirs with Christ if indeed we suffer with Him, that we may also be glorified together. As believers, evidence of our salvation is the Holy Spirit of God who dwells in us, guaranteeing our salvation and resurrection.